Many guests at Undara are intrigued by the attraction’s history. 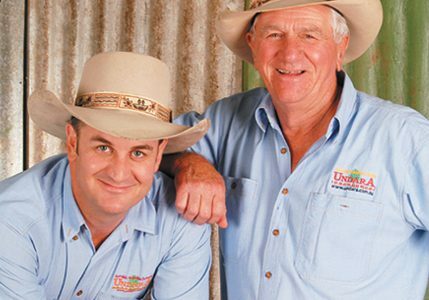 The Undara Experience is designed and produced by the Collins family, the earliest white settlers in this locality whose cattle grazed in the area since 1862. Gerry Collins, a fourth generation member of this pioneering family, applied to develop a tourist facility to showcase the Lava Tubes located on his family holding, Rosella Plains Station, in 1987. Gerry believed the best way to protect these dramatic, ancient formations for future generations lay in developing a sustainable visitor experience, managed to lessen the environmental impact but highlight the unique ecology and geology of the cave system. Working closely with regional and state government bodies, the Collins family proposed a national park should be gazetted around the caves, and tours to the lava tubes be accessed from a lodge facility managed by the family. In December 1989, the theme of the Undara Experience accommodation was born when Gerry discovered eleven decommissioned Queensland Railway carriages on a siding in Mareeba. The carriages were duly purchased and restored to provide the unique style of eco-accommodation that Undara Experience has become well known for. In May 1990, the recycled turn-of-the century rail carriages were placed between the trees beside an old teamster’s trail, preserving the ecology while allowing guests a uniquely personal experience of the Queensland bush. “Undara strives to inform visitors about past and present lifestyles in the region; how this ancient land was formed by natural forces and climatic changes over hundreds of millions of years; it’s link with other continents when it was part of Gondwana; the evolution of its flora and fauna; and the need to treat it with care so that its spectacular and rugged beauty and wealth of wildlife remain for future generations to marvel at and protect in turn.” Gerry Collins. His son Bram, who grew up with the lava tubes as an adventure playground, is the Managing Director and works with the team to deliver the product & service that the Undara Experience has become famous for. Showcasing the tubes is a passion passed between the generations. The Collins family history has been documented in a book Cattle in the Blood.